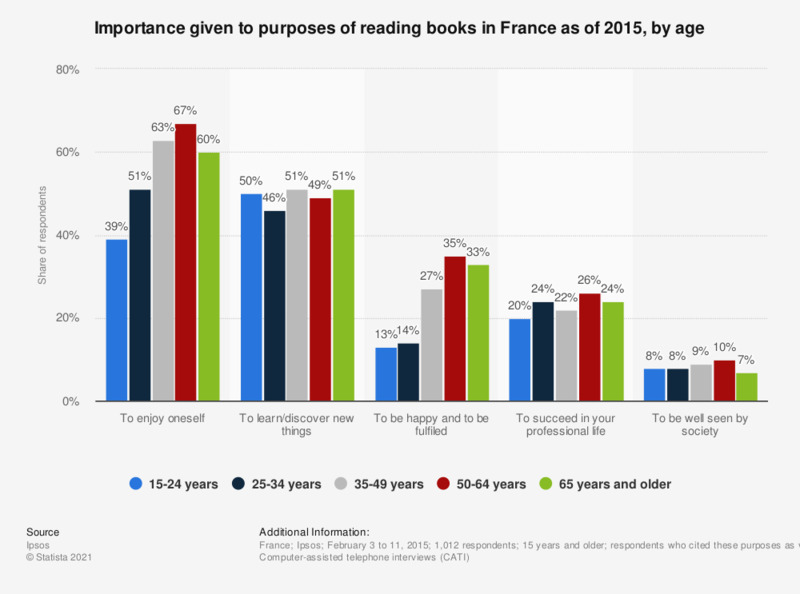 This statistic display results of a survey conducted in France in February 2015 about the purposes of reading books. For each purpose mentioned above, the percentage refers to the share of respondents who considered this purpose of reading as very important. Results reveal that the importance given to these reading purposes varied according to the age group. For instance, the share of respondents aged 50 to 64 who considered that reading books in order to be happy and fulfiled was very important was over two times higher than the one among respondents aged 25 to 34. The source does not provide the number of interviewed respondents. The shares corresponds to the respondents who stated that the corresponding purpose of reading was very important to them.